Ever since my little man started learning to get around by himself, I've been calling him Monkey Head. 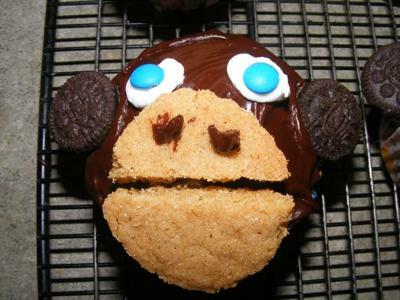 So when I saw these monkey cupcakes in a magazine I just knew that I have to make them for his first birthday. The recipe called for premade ginger snap cookies and brown mini m&m's for the eyes, but I made my own cookies and cut them in half. Blue mini M&M's were used to match my sons eyes. The cupcakes were a huge hit with the kids and they are pretty good for you too as they are full of bananas. 1. In a large mixing bowl, cream shortening and sugar. Add the eggs, vanilla, bananas and buttermilk. Combine the flour, baking powder, baking soda and salt; add to banana mixture. 2. Fill 18 paper-lined muffin cups two-thirds full. 3. Bake at 350 degrees F for 15-20 minutes or until a toothpick comes out clean. Remove to wire racks and be sure to cool completely. 4. Let cool completely before frosting and adding on decorations.